A New York Girl Scout troop is raising money to fund the first statue of a woman in New York City’s Central Park. Central Park is home to 23 sculptures and busts honoring men, along with two sculptures honoring fictional women, Alice in Wonderland and Mother Goose. Even a heroic dog has a sculpture in the 843-acre park, but no statue commemorating real women of history. 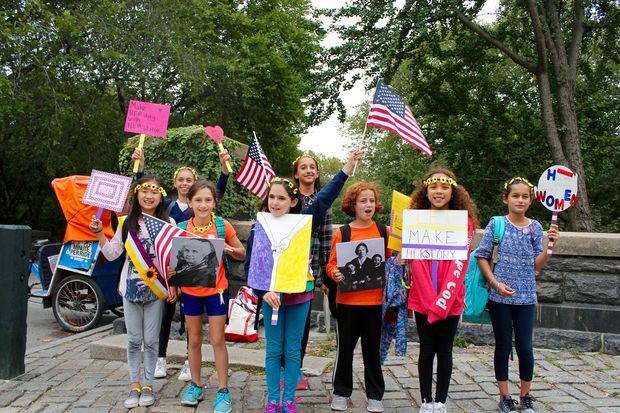 The troop joined activists in a fundraising campaign called “Central Park, Where Are The Women?” Their goal is to have statues honoring suffragists Susan B. Anthony and Elizabeth Cady Stanton by 2020, the 100-year anniversary of women being granted the right to vote. So far, they have collectively raised $150,000 out of the $500,000 needed for the sculptures. The girls plan on collecting money for the cause in Central Park on Thursdays until winter.